What does the bottom number in a time signature mean? The top number tells you how many beats are in each measure in your piece. (Measures are simply the way music is divided up into a rhythmic pattern). 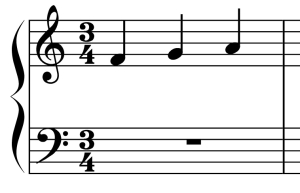 So, a four on the top, as seen in the time signature above, means you’ll count like this: 1-2-3-4, 1-2-3-4, 1-2-3-4 throughout your song. If I change the top number, you can probably figure out how you’ll be counting throughout the song. Take a guess. Give it a try. Really. Did you try it? If you guessed 1-2-3, 1-2-3, 1-2-3, you’re right! If you guess something else, contact me and we can talk it through! 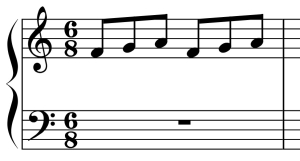 The bottom number indicates which type of note is getting the beat. 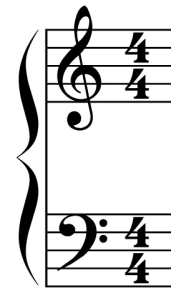 If your time signature is 4/4, you can fit 4 quarter notes into one measure. So, when you say 1-2-3-4, each of those numbers (beats) will be a quarter note. Similarly, if your time signature is 3/4, you can fit 3 quarter notes into one measure. 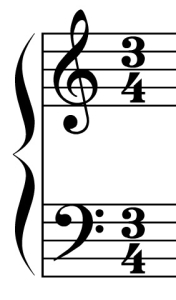 If your time signature is 6/8, you can fit 6 eighth notes into one measure. You’ll count 1-2-3-4-5-6 and each of those beats will be an eighth note. You may also see a 2/2 time signature. 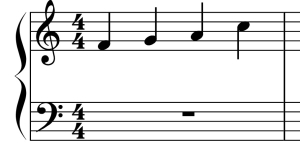 In this case, two half notes fit into every measure – 1-2, 1-2, 1-2. You may (correctly) figure out that it looks alot like a 4/4 time signature. The differences are subtle and nuanced, so I’m not going to take the time to write them all out here. If you just have to know about those nuances, contact me and we can talk about it specifically. Ask your questions or suggest other music theory questions in the comments below! This has been such a confusing topic for me and I have yet to find an explanation that helps. Your page was perfect and I have bookmarked it for future reference. Thank you so much for your help! Could you please explain to me about the bottom number of the time signature? 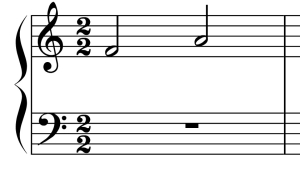 I know that the top means how many beats per measure, but I do not know what it means about the kinds of note of getting one beat. I am confused about the one beat in the bottom number of the time signature. Thank you for your time to reply. Hi George ! I have the same issue too . Did you get a response to your question ? Perhaps you can share with me then. Thank you. Actually my problem is setting the metronome… I know all those numbers must mean something…. but what? Hi Lawrence – metronome numbers are the number of beats per minute. Small numbers mean fewer beats per minute (a slower tempo) and big numbers mean more beats per minute (a faster tempo). The metronome is a tool to help you keep a steady tempo. You can use the numbers as a general guideline to know how fast something is intended to be played or sung.